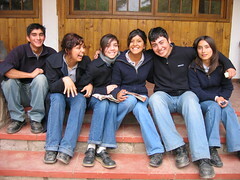 A group of sophomores at IAPB pose for a picture wearing their school uniforms. The unform is blue jeans all the time with a gray polo shirt for class work and a green polo shirt for field work. See more photos. This is the third article in the Work Week series. I start Wednesday morning on my bicycle, riding through back streets in the Chilean countryside. It’s a 20-minute ride to the Pascual Baburizza Agricultural Institute where I help with English classes. Sometimes the warm sun on my face wakes me up as I go; recently, the icy cold wind does that job. After I arrive and lock up my bike, I have a short five-minute walk from the bike rack to the school to get hair back under control. Then it’s class time. The Pascual Baburizza Agricultural Institute (IAPB) is a technical high school where Chilean students study all the typical high school subjects—math, Spanish, science, art, foreign language—plus learn in the field all the aspects of farm work. By the time students graduate, they have 500 documented hours of experience with sowing, harvesting, animal production, irrigation, and so forth. The school is an impressive facility. It covers more than 50 acres and it has a scaled-down chain of all the typical equipment on a farm. The buildings themselves are also well-kept and far from run down. 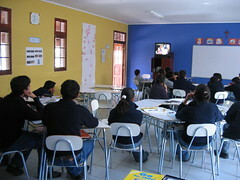 Students watch an English video during class. All this is a nice change because the students who study at the school aren’t used to such facilities. Most who study there come from relatively less-privileged backgrounds. Many attend the school on the basis of scholarships. In IAPB, it seems to me that they have a fantastic opportunity. 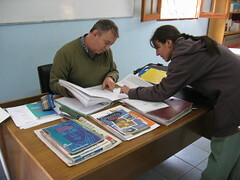 One of the many subjects the students study is foreign language. Each student studies English for four years. There is a push now more than ever because people working in agriculture who speak English will be more able to communicate with multinational companies. Additionally, scholarships are available for select students to study in the U.S. after graduation. This is where I enter the picture, though not because of my extensive training (I don’t have any formal training in education). My primary qualification is that I speak English. During my years in school learning Spanish, I often felt that I was being taught by teachers whose only qualification was that they could speak a language, not that they were any good at teaching. How the tables have turned. In my defense, being able to speak English is something that a significant number of English teachers in Chile can’t do. Two of my coworkers are Hernán, who teaches Spanish, and Alejandra, who teaches English. Thankfully I’m not in the classroom alone. I work with Alejandra Muñoz, IAPB’s English professor who is an excellent teacher. On top of that, she speaks English well. She develops the lesson plans; I just execute them. Of course every class is different, but the general tasks remain the same. When the students do workbook exercises, I walk around answering questions; I drill the students during practice sessions; I pronounce words and offer advice on how to say things; I explain new ideas to the class. For the most advanced classes, I correct compositions. It is truly interesting to teach from Spanish to English having experienced the transition from the other direction. For one, learning English pronunciation from Spanish is much more difficult than vice-versa. There are many sounds in English that don’t exist in Spanish, but very few in Spanish that can’t be easily approximated in English. Plus English pronunciation changes all the time. Allow me a linguistic digression. I like U2’s live album. Tell him to close the door. Are we close to the castle? There is an obvious difference in the pronunciation of “live” between 1 and 2, but no obvious indication of that besides context. In the second set, the difference is much more subtle but still present: “close” is written the same in both sentences, but it takes a buzzing z sound in 3 and a soft s in 4. (If you don’t believe that they’re pronounced differently, check the pronunciation guide in a dictionary). Those things are hard to teach. Another difficulty is that Spanish and English share many verb tenses (the simple present, present progressive, simple future, and so forth) but they are not used uniformly between the two. Wednesday I work with a class of freshmen, another of sophomores, and one with seniors. The sophomores are decidedly my favorites. The freshmen are too new to be well behaved, the seniors too old. In many of the classes, the students seem eager to learn, but I find that they lack motivation and study skills. The scheduling of classes doesn’t help either—each class meets only once a week for 2.5 hours. With a subject like a foreign language, you need more frequency and less duration. I finish my last class at 4:15pm, at which time I get back on my bike and ride off into the distance.